We are always eager to test entry-level stuff as we firmly believe anyone should be able to enjoy good tunes at home without spending an arm and a leg or selling his house. And while many customers would like to know how entry-level HiFi components sound like, HiFi mags rarely devote any of their hi-gloss fully coloured pages to them, preferring to write about the latest hi-endish hyper-zoot super-duper stuff. Not so TNT-Audio. JVC (Japan Victor Company) is a worldwide-known Japanese consumer electronics Company which is deeply involved in developing the latest audio-video & multimedia technologies. So audiophiles, especially the novices & newbies of any kind, may be not aware of the fame some JVC CD players have earned during the past decade. 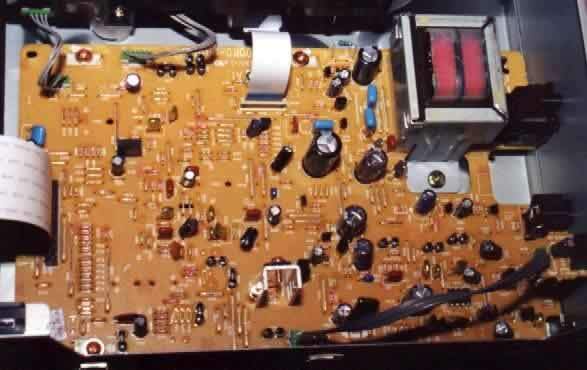 In the early '90s JVC developed a proprietary circuit for a more accurate D/A conversion, called P.E.M. (Pulse Edge Modulation, in contrast with the common PWM, Pulse Width Modulation) which gave a big "plus" to their CD players so that even the most die-hard audiophiles had to recognize those machines played extremely good noises. In particular, that circuit allowed the JVC CD players to reach the limit of the maximum theoric CD digital resolution, approaching 15.9 dB (max theoric being 16 dB). Almost nothing survived of that generation of digital machines and now JVC makes just one CD player, this XL-Z 232 under test. To be more precise, there's also a simplified version, labelled XL-Z 132, which is identical except for the remote control (not available) and a couple of minor functions ("index" and "total remain"). They both share the same renowned P.E.M. DAC conversion technology which allows extremely good technical data (claimed). Dynamic range: 98 dB (@ 1 kHz), signal/noise ratio: 106 dB, THD: less than 0.0025% (@ 1 kHz), channel separation better than 94 dB (@ 1 kHz) and a frequency response between 2 and 20.000 Hz (+- 1 dB). Plus, for a suggested retail price of 200 $/Euro the JVC player offers: a centrally-placed CD transport called "center of gravity" (perhaps from Panasonic/Technics), an optical digital output, 2 Compu-Link jacks used to synchro-link other JVC appliances (amps, decks etc), direct track access by means of a numeric 10-keys pad, a complete remote control and, technically speaking, a so-called Z chassis (where "Z" stands for Zero vibrations), 1 bit P.E.M. D.D. digital conversion and 8x oversampling digital filter. There's just one thing which is missing: an headphone output jack. This CD player is commonly sized: 43.5 (W) x 10.1 (H) x 28.1 (D) cm and it weighs in a mere 3.5 kg (7 lbs). The CD player has been designed to stay permanently in stand-by (a red led indicated this status). If you don't feel comfortable with a continuous 4 watt power consumption, you need to detach the mains cable. 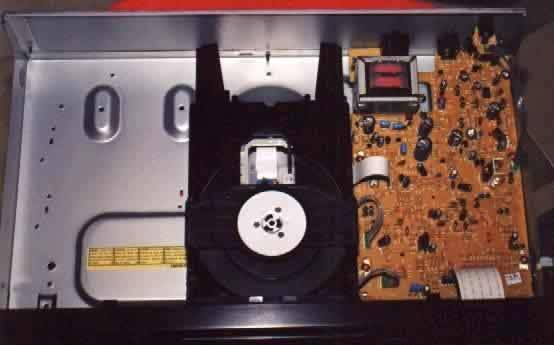 This way your JVC CD player would need a burn-in time each time you want to play it. So the advice is to leave it permanently in stand-by mode. While playing the power consumption is 10 watts. The light-blue diplay is easily readable even from distance and shows any kind of information you may ever need. Switches and buttons are very easy to locate and use, while the input from the remote control is extremely efficient, even when you point it towards the opposite wall. Considering how badly perform many remote controls on expensive "audiophile" CD player, this one is soooo relieving!!!! The inside view of the CD player doesn't explain much, since it is half-empty, as usual on entry-level modern CD players. The JVC XL-Z 232 has been extensively tested both with my reference system and my budget rig. I've tested it even as a mere CD transport (thanks to the optical digital output) connected to a top-class DAC converter. Technical aspects aside I was mainly interested to know how this player performs. I've some experience with entry-level CD players so I was prepared for a certain kind of musical reproduction, normally associated with cheap circuits and components. BUT!!! Since the first notes, the JVC XL-Z 232 has surprised me with a RARE refined performance, given the price range. In particular, the mid-high range is extremely clean and detailed, with even an airy touch that puts this player into a league of its own. The quality of the mid and high range is one of the main problems with inexpensive CD players: they always sound grainy, rough and harsh....not so the JVC XL-Z 232 which sounds natural with a top end range that makes more expensive players (even 3x!!!) struggle when compared with the small Japanese player. Though harmonically not very rich, for example it lacks some liveliness on "pizzicato" and some metal strings instrument, this player is stunning, especially if you think it costs just 200$. Oh yes, its mid-range can appear metallic at times and the bass isn't always as controlled as one would expect...but there's still weight and extension till the lowest octaves. It doesn't have the explosive bass slam of a hi-end transport + DAC combo but it can still decently play the Sheffield Drum Record at a realistic level. The mid-bass appears a bit on the light side and with strong male voices it lacks authority and weight. Instead, with female voices, the JVC offers a grainless reproduction, refined till the upper end even if not always smooth and sweet. As previously noted this player lacks the energic bass slam needed to fully reproduce the electronic bass notes of some recent Music ("Mezzanine" by Massive Attack or "The Fat of the Land" by Prodigy) but please consider some of these records are a severe test for any piece of HiFi (or hi-end) gear. To counterbalance this lack of authority in the lowest octaves, the JVC XL-Z 232 offers a stunning punch in the 100-200 Hz range, with plenty of sheer energy and right pace. The dynamic performance gets better as we move towards the mids and highs, where this player clearly beats hands down any competitor I've listened to in the price range (including the good Teac CDP 1120. A good sense of pace and rythm help to produce a lively and vivid sound. The ability to reproduce and create a realistic soundstage is a difficult task for any entry-level HiFi component. Honestly, the JVC isn't much better than its competitors and so it lacks some depth of the image. The virtual planes aren't clearly defined and so the scene appears crowded and a bit confused. Also, the stage is a bit forward and there's nothing left behind the speakers. Let me remark, once again, that similarly-priced CD players can't do any better. Then we have some blurred contours so that players and singers appear not precisely placed into the stage. Since this player has an optical digital output it can be easily used as a cheap CD transport, connected to an external DAC. The reason why this CD player offers the digital output is for recording purposes, when used with a Minidisc or CD-R recorder. Anyway, I was soooo tempted to use it as a transport...that I couldn't resist. And let me say that many faults of the sound of this player simply disappear when using a good external DAC. First of all, the soundstage. Yes, there's some soundstage to speak of, wide, focused...though still lacking some depth. The overall sound is now harmonically richer, with an improved sense of realism and transparency. Even the bass range benefits from the external DAC, with added control and weight. Still not explosive in the lowest octaves, though, but definitely something one can easily live with. Since the player has been designed to stay permanently in stand-by mode, please leave it so. This means less stress for the circuits and better performance since the first seconds. Given the fact this CD player is, like most of its colleagues, EMPTY (inside) I'd have preferred a less bulky aspect. The chassis, even if of the claimed "Z" type, is still resonant, especially the U-shaped top cover. This is secured to the chassis via 6 screws (good choice to fight vibrations) but his isn't clearly enough. A next-to-come tweaking session will unveil how to get rid of any vibration. The 4 BIG feet have a "pro" look but don't help reducing vibration, though. The detachable mains cable is simply terrible. An IEC plug would have worked better. Alternatively, I'd have preferred a soldered mains cable (good for reducing contact resistance). The digital output is optical and seasoned audiophiles are well aware of the fact that coaxial electrical outputs sound better. For what I've seen looking at the inside, it seems quite easy to build an electrical output at home in 5 minutes. Finally, instead of sooo many complicated features (32 track programming etc) I'd have preferred an output jack for headpones and a dimmer to adjust the light of the display. I've nothing much to add to what I've already written about the sound of this player. When compared with expensive digital gear the JVC XL-Z 232 shows its clear faults but, believe me, you can still listen Music through it even after an audition with expensive transport + DAC combos. When compared with similarly priced colleagues the JVC does have some pluses that put it into a league of its own. For example, while it doesn't have the bass slam of the above mentioned Teac CDP 1120, it beats this competitive player thanks to the grainless overall sound, undistorted highs and lively dynamics. Considering what the JVC has been able to do as a pure CD transport, I think there are large margins to get something more from it, for example with a TNT-like tweaking session or a TNT-Convertus external DAC. I will let you know in a next article, so stay tuned. Every time I find a so high sound quality in a so inexpensive HiFi component I start to think there's some hope for audiophiles on a (strict) budget. A CD player ike this, even if NOT tweaked, can produce extremely good tunes and in some areas it can rival the performance of 3 times more expensive players. Match it to a 250$ audiophile amp and a pair of speakers in the 500$ price range and you get a sub-1000$ HiFi system that can sound quite good. When an upgrade is needed one can always buy an external DAC (or build our excellent TNT Convertus) so to improve consistently the overall performance of the whole HiFi system. Finally, let me remark it's a pity that JVC no longer makes better players...for sure its know-how in the digital field would have created outstanding machines at extremely competitive prices (considering what JVC has been able to do with this inexpensive XL-Z 232).